There are many interesting photographs in this book from Morning Sun Book's photograph collection. Not all the locomotives are grimy from poor maintenance. 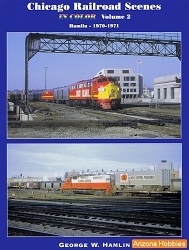 Many photographs show units freshly painted in the many various paint schemes used by the Rock Island. Some photographs are one per page - great detail for the modeler! At Eldon, Missouri a Whitcomb 44-tonner idles while an H15-44 waits in the background for assignment. Passenger locomotives are in the later paint schemes and most units are from the maroon and stripes, maroon and yellow, and bright red and yellow eras. 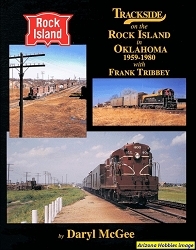 The book finishes up with The Rock image and METRA running on former Rock Island territory. As a Rock Island fan, I enjoyed the photographs in this book a lot. To say the Rock Island's locomotive roster was unique is an understatement - from the unorthodox purchasing of 44-tonners from Davenport and Whitcomb rather than then-standard General Electric, to the late Alco-era C-415 switcher model and EMD (and EMC) TA and AB models, to the standard E7 and E8 designs. Alco cab and booster units, re-engined by EMD, oddball Lima 800 HP LS800 models, and other abnormalities made The Rock a railfan's paradise in the 1960s and 1970s. Running on a shoestring budget in later years, the Rock Island acquired used locomotives from many sources, often through local supplier Precision National Corporation and suitor Union Pacific Railroad. 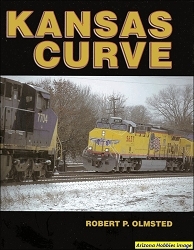 Diesel locomotive fans will enjoy exploring the roster of this railfan legend with diesel authority Steve Timko.